Looking back at how this flea market came about and why it is important to find a permanent home for it. The sights of Sungei Road flea market. What a pity! That market which opened in the 1930s during the Depression Days for the poor to tide their poverty days over was closed on July 10, 2017. It survived the Depression Days. It survived pre-war days. It survived during the Japanese Occupation. It survived the British Administration Days. It survived self-government days. It survived when Singapore was in Malaysia. It survived 50 years after independence. But now it has faded. During the Japanese Occupation, the Japanese allowed that market to trade in hard-to-get day-to-day essential items as well as gambling, which was actually prohibited during the British time. Trade in secondhand products was allowed. These products were discarded by households, obsolete, condemned by schools and industries, brought in by tourists or sailors, or purchased en-bloc from clearance of warehouses, moving house sales or from firms that had gone bankrupt. Thieves also jumped on the bandwagon. They sold their loot there too. Transactions were simple – the sellers quoted a price and it was up to the customers to bargain. If the price seemed fair to them, money then changed hands. No questions were asked on the origin of the product. The market was once referred as “The Thieves Market”! The product purchased was also not guaranteed to be in perfect order. There was no after-sales service or goods-returned agreement like what we have today. If one was not satisfied with a product, the vendor whom you bought from may buy it back from you at a much lower price than you paid or simply refuse to buy back outright. Those days a car owner whose wheels were stolen could find them selling there! Counterfeit products, blue films and banned products also found their way there. While rich people patronised at places such as Robinsons, poor people did not want to lose out. They referred to that market as “Robinsons Petang” or “Afternoon Robinsons” as it was operated only in the afternoons. Some people called it “Kek Sng Kio” in the Hokkien dialect or “Frozen Ice Bridge” in literal translation as there was an ice factory producing ice to supply all over Singapore in the ’50s, ’60s and ’70s. As there was a bridge over Rochor Canal connecting Arab Street and Weld Road, some others called it “Kangar Kee” in Hokkien or “By the Side of a River” in literal translation. Those words “Sungei Road” were a mixture of Malay and English. “Sungei” is a Malay word which means river. If one puts the two words together in English, it would be “River Road”. Before the 1970s, the afternoon market covered a very wide area – from Rochor Canal to Jalan Besar and from Weld Road to Kelantan Lane. Other than the products earlier mentioned on sale, there were cheap services too. One could get his shoes repaired, his watch fixed, his electrical items repaired, canvas accessories repaired, or worn-out pots and pans repaired, oversized clothing altered or even recycled tin cans or drums that could be turned into water containers. One also could find used military ammunition containers and boxes from the Vietnam War. In the 1970s, a series of fires burned several houses there. The buildings in the whole area including the decommissioned Ice Works were demolished. 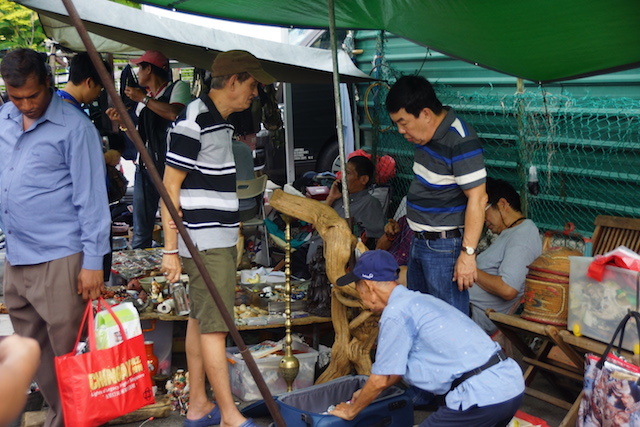 The vendors were allowed to sell their wares in the lanes within the stipulated area. They were not allowed to sell their wares along the main roads. Environmental officers or “Tet Gu” literal translation “Land Cows” often raided and fined those who strayed beyond the confined areas. The “Lookouts” often gave some sort of warning in advance – shouting “Tet Gu Lai Lo” in Hokkien – literal translation “Land Cows have come”. All the illegal vendors would then hurriedly pack up their goods and either run to escape for fear of being caught or mix in with the shoppers pretending to purchase something from the legal vendors. Those goods left behind were confiscated. Police were often seen raiding the blue film sellers. At that time, those films were in the video cassette format. Later, the compact disc format was introduced. Those vendors were often quick to devise plans to outwit the police. They would place their banned products at strategic points and stay alert. Buyers would choose their items and money exchanged hands at secluded corners. Police detectives too were there to catch the sellers red-handed. Sometimes they escaped after struggling with the police due to the presence of the crowd. Pickpockets also made a hay day there too. Often, we heard shouts “thief!” and the culprit would fly like an arrow elbowing through the crowd, dragging down the displays of other stalls in his way. The owner would shoot out but give up after a short chase. Due to police presence, pickpocketing became a rare sight. By and by, in the 1980s, due to strict patrol by the police and environment enforcement officers as well as changing sales tactics by the blue film suppliers, the blue film trade died. New products were not allowed on sale as some traders from the shopping malls took advantage of the crowd to make some quick sales without overhead charges. In the early 2000, lots were drawn and each vendor was allowed a stipulated lot. They all had to be registered. Every afternoon the environment officers would take their attendance. Every evening at about 6pm, the environment officers would remind them to pack up and all would do so obediently. Many looking for items to buy. 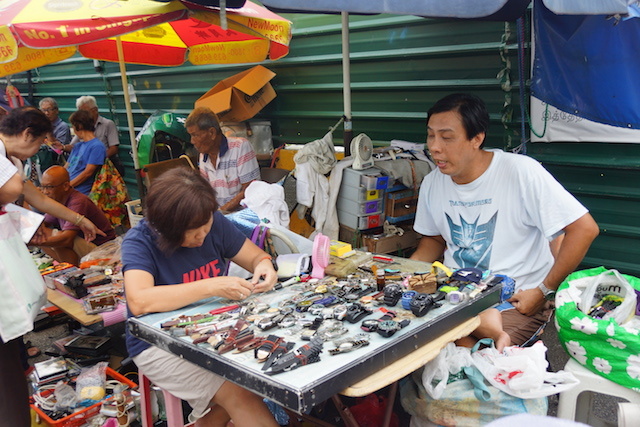 Today, Sungei Road market has become an internationally known flea market. It draws its clientele from all over the world as the products are varied. Keen-eyed enthusiasts would find treasures at a tuppence. Others would find well-known products working and looking new after replacing simple parts. Some would buy and then discard them as they were not working. They did not mind as they would buy them cheaply. I got my collections of stamps, postcards, matchboxes, old bus tickets, old photographs, manual cameras, manually-operated household utensils such as the charcoal irons, record players, or even oil lamps, mostly from flea markets such as Sungei Road, Club Street, Chinatown and antique stores in Singapore. These items have become my resources for my writing. The vendors at Sungei Road market have no other suitable skills for modern-day industries or offices. They were carpenters, masons, factory workers and not well-educated. They are in their 60s to 70s, and do not like to depend on their children. They do not like to sit at home or at a coffee shop to wait for death. Some have to look after ailing spouses or handicapped children. They do not want to wait for Government handouts either. They are still able to hobble around and make a little every day to support themselves and their families. They also do not want to go to the Housing Estate area where their clientele is not there. In wherever countries we go to, there are flea markets like that of Sungei Road market. They cater to a very specialised section of the population, to people who appreciate the patience and fine handicraft of the creators of the few items left in the world, such as automatic watches, manual cameras, old radios and TV sets, and other manually-operated items. These people collect, recycle and reuse items which people often discard, thus helping to delay global warming. These people need to find such items and they need to interact with like-minded colleagues to widen their knowledge. Maybe these stalls could be set up along both sides of Rochor Canal pavements so that these vendors can continue to have a livelihood and people like me can come to a place to find little treasures. It would be sad to lose for good such a great find. Yeo Hong Eng, 67, is the author of “The Little Red Cliff: 1946-1963”. He still teaches part-time in a primary school and writes heritage blogs, and collects and exhibits heritage items in schools and shopping malls. An enlightening and interesting write-up by Mr Yeo. Thank you, Eleanor and Mr Yeo! Yes, it’s a pity that “Robinsons Petang ” is gone. Another one should be built. Thanks, Ellen for your comment.